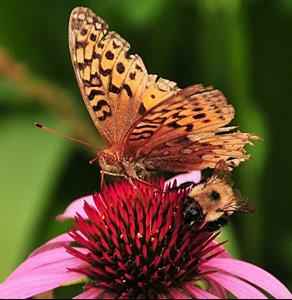 The year 2013 will go down as the summer of the Great Spangled Fritillary. Sadly, after a particularly hellish Spring, not one person in my part of the country has seen a Monarch Butterfly this year. I have an entire field of Milkweed waiting for them to come feed, and several gardens to entice them, but there are none. This will go down as the year of the Flitillary. I have photographed them on Milkweed, tree leaves, sunflowers, and even made an attempt to catch a photograph of one that seemed to fancy something in one of my bird feeders, but none of them would light upon my Echinacea flowers when I was present until today. My Echinacea flowers have been blooming all month long. I have them in white, bright pink, and purple. They have been busy with bees, and visited by tiny butterflies, but what I wanted most was a photograph of the Great Spangled Fritillary butterfly atop a coneflower for this month's show. Today, with little time to spare, I finally got my wish. 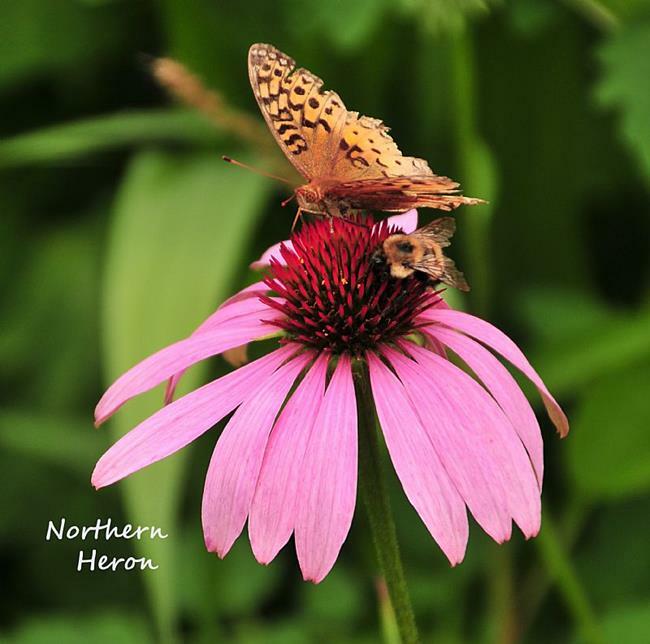 The purple coneflowers are now the ones blooming and it seems this is the variety the butterfly species loves most. The bee was an added bonus, and seemed a fitting reward for my patience. The head of the coneflower is plenty big enough for both of them to feast, and it was such a treat to see them enjoy the flower together.